Have an idea you’ve been dreaming about, but need a partner to execute it? Give us a call. We love creating custom pieces with our own material & finishes. This mix of fully surfaced reclaimed Tropic Hardwoods includes an eclectic mix of colors and wood grain -perfect stock for a feature wall. We have a 300 sf minimum order quantity, or “must take all” if the quantity shown is less. 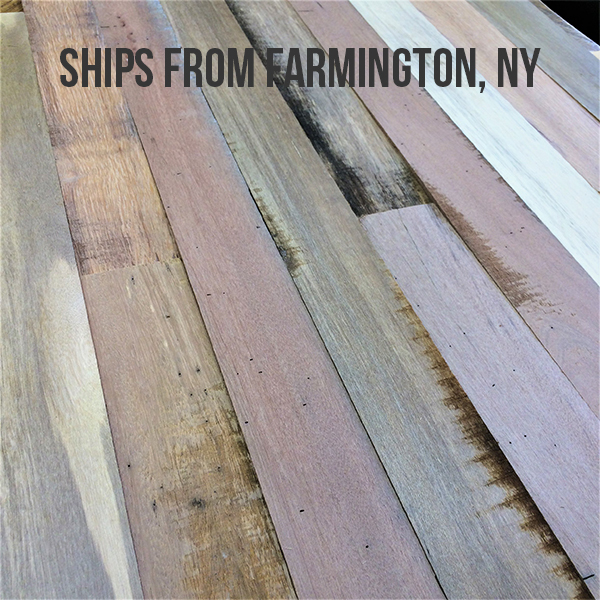 Please note that these batches reside in our East Coast Shop near Farmington, New York. The location of each batch is listed at the top of each image for your reference. FYI, samples are not available because of limited quantities. We suggest that you order quickly as these batches don't sit on the shelf long. All photos for representation only.